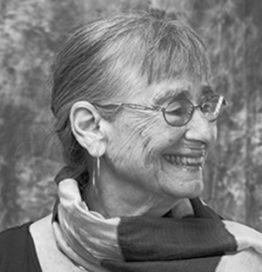 Alicia Ostriker is a poet-critic, twice a finalist for the National Book Award in Poetry, twice winner of the Jewish National Book Award in Poetry, received the William Carlos Williams Award, fellowships from the National Council on the Arts, the Guggenheim Foundation, and the Rockefeller Foundation, among others. Her poems have appeared in The New Yorker, the Atlantic, the Massachusetts Review, the Harvard Review, and the American Poetry Review, among others, and have been translated into numerous languages including Hebrew, Arabic, and Japanese. She has published sixteen volumes of poetry, most recently The Old Woman, The Tulip, and the Dog (2014), and Waiting for the Light (2018). As a critic, Ostriker is the author of Stealing the Language: the Emergence of Women’s Poetry in America, and other books on poetry and on the Bible. Ostriker sees herself as a spiritual seeker who wrestles with the Bible and Jewish tradition, and looks forward to the rebirth of the Divine Female in our culture—she who has many names and in kabbalah is known as the Shekhinah—we may all serve as midwives for her. Here is some text from the back cover of a book just published by the University of Michigan Press, Everywoman Her Own Theology: Essays on the Poetry of Alicia Ostriker: Alicia Ostriker’s artistic and intellectual productions as a poet, critic, and essayist over the past 50 years are protean and have been profoundly influential to generations of readers, writers, and critics. In all her writings, both the feminist and the human engage fiercely with the material and metaphysical world. Ostriker is a poet concerned with questions of social justice, equality, religion, and how to live in a world marked by both beauty and tragedy.